Have that silky salon smooth hair at the comfort of your own home! This new 2 in 1 Steam Hair Straightener and Curler Flat Iron With Vapor Ceramic Tourmaline will definitely have you wanting to own this. At normal temperatures, hair is rigid and won't respond to styling. At too high temperatures, the hair bonds can become permanently damaged therefore causing breakage. Our technology targets the temperature zones in between these two phases when hair is pliable for safe, effective styling. Salon-Quality Straightening with Steam Function - Enjoy a polished salon finish at home with this professional-quality flat iron. Designed with 1-inch ceramic plates, the iron achieves high, consistent heat that reduces frizz and damage as it straightens your hair. Applying steam technology, with argan oil or water put into the tank on the flat iron, the hair can be protected well during hair straightening. Tourmaline Ceramic Technology for Smooth Results - High-grade tourmaline ceramic plates for a snag-free glide and more even heating than traditional flat iron straighteners. The floating plate design ensures your hair stays in contact with the heat, resulting in faster styling and smooth, healthy hair. A salon-length swivel cord offers greater styling flexibility. Convenient LED Temperature Display Aids Styling - Monitor the flat iron's temperature on the easy-to-read LED display. 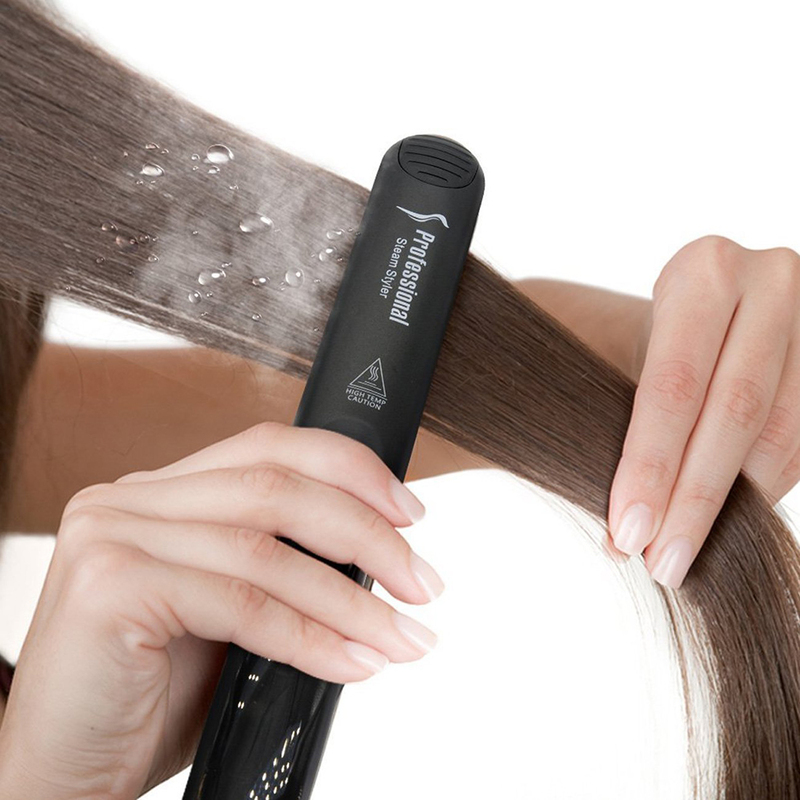 Adjustable Heat - Straighten your hair with heat up to 450 degrees Fahrenheit. Simple two-button controls allow you to increase and decrease the heat to your desired level. Temperature lock mode prevents overheating and keeps the setting secure as you style.